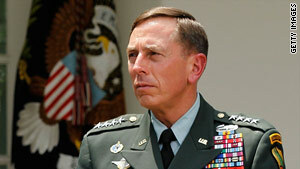 Gen. David Petraeus has been tapped to take over as the top U.S. commander in Afghanistan. He recently said the trajectory in Afghanistan "has generally been upward"
Washington (CNN) -- President Barack Obama has asked Gen. David Petraeus to replace Gen. Stanley McChrystal as the top U.S. commander in Afghanistan, he said Wednesday. Obama relieved McChrystal of duty over disparaging comments the general's staff made about top White House officials in an article in Rolling Stone magazine. Petraeus, a counterinsurgency expert, was the architect of the "surge" of U.S. forces in Iraq, which some credit with turning the tide of the war. He was promoted to head of the U.S. military's Central Command in October 2008 by President George W. Bush. Obama said there would be no change in policy as a result of the switch in commanders, but Petraeus and McChrystal have struck different tones in describing the Afghan campaign recently. "The trajectory in my view has generally been upward, despite the tough losses, despite the setbacks," Petraeus told the Senate last week -- a day after fainting while giving testimony. He blamed dehydration when he appeared the next day, June 16. McChrystal had said just days before that the campaign against the Taliban in Helmand province would take longer than he originally planned. Questioned by the Senate Armed Services committee about the difference in emphasis, Petraeus said: "The conduct of a counterinsurgency operation is a roller coaster experience; there are setbacks as well as areas of progress or successes." Petraeus will step aside as chief of Central Command to take over as Afghanistan war commander, a senior national security source told CNN's John King. His appointment to lead the U.S. war effort on the ground in Afghanistan requires Senate confirmation. Senate Armed Services Committee Chairman Carl Levin, D-Michigan, told CNN that he hopes to hold confirmation hearings for Petraeus as early as next week. Obama's decision to replace McChrystal with Petraeus was "reasonable," Levin said. The chairman of the House Armed Services Committee immediately expressed his support for Obama's choice. Petraeus "is the best that we have," Rep. Ike Skelton, D-Missouri, said in a written statement. Sen. Jack Reed, D-Rhode Island, called him an "experienced, thoughtful commander who will step in and provide a continuity of leadership." Petraeus all but literally wrote the book on fighting against guerrilla resistance, overseeing the drafting of the Army/Marine Corps Counterinsurgency Field Manual between stints in Iraq. He commanded the 101st Airborne Division, the Screaming Eagles, during the first year of the war in Iraq, according to his official biography on the Central Command website. He then commanded coalition forces and the NATO training mission in Iraq. Petraeus then spent time at Fort Leavenworth, Kansas, working on the counterinsurgency manual before returning to Iraq to take charge of the surge. He holds a doctorate in international relations from Princeton University.